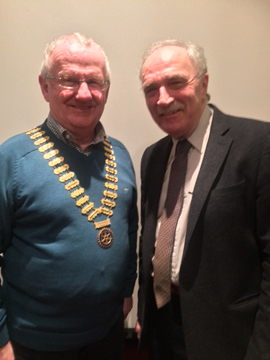 The club was delighted to welcome Harry McConkey to the weekly meeting on Monday 19th June. Harry gave a short report on the Grumpy Old Men's event he held recently in Pat's Bar. A large number of friends attended the event, Harry showed some footage of football matches, and the men had a chance to "moan" about anything that troubled them. A signed Republic of Ireland shirt and a pair of Michael McGovern's gloves were raffled. Harry presented a cheque for £1,350 to the Willowbridge Minibus Fund. The project to refurbish the parent's accommodation block in Crumlin Children's Hospital in Dublin began about eighteen months ago. 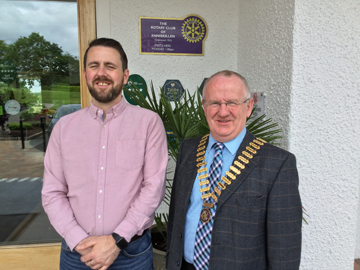 This project was initiated by Rotarian Daniel O'Reilly with the support of Monaghan Rotary Club as a result of Daniel's son Daithi being admitted to the hospital for Cardiac surgery. Living accommodation for families staying in the hospital was poor and very outdated. 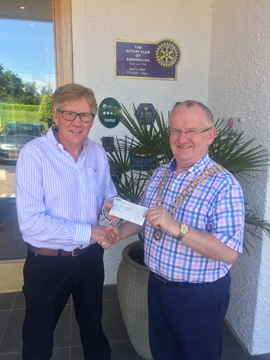 An appeal went out to Rotary Ireland and up to 30 Clubs supported the project, Enniskillen were one of the first clubs to donate £1,200. The project involved refurnishing 48 bedrooms, replacing windows, fitting black-out blinds and replacing old doors thereby making the rooms more habitable. The aim of the project was to aim for 100k euro, with the hope of getting 20k euro. To date the project has raised 90k euro and is due for completion before the end of June. Daniel and some friends organised an Artic Challenge event in September 2016, this involved a thirteen day trip travelling to Oslo and riding a 50cc Honda in the Artic circle. Peter gave a brief history on the lifeboat station which was established in 2000, it was the first freshwater inland station. 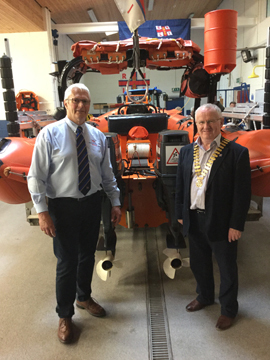 Peter works closely with local schools educating them in water safety, and clinics are also organised at which members of the public can have their lifejackets checked to see that they are sea safe. The crew attend weekly training sessions which include water safety, first aid, navigation skills and people skills. Each crew member will also attend an intensive one week training course at the RNLI headquarters in Poole. At present there are 28 crew members male and female attached to the two inland stations at Killadeas and Carrybridge. When an incident (shout) arises the crew are alerted by the Coastguard and proceed to the relevant station, the normal launch time is ten minutes. The station has an Atlantic 75 Rib normally manned by three crew and a Rescue Water Craft normally manned by two crew. The local stations had a total of 65 shouts in the last year. Following the visit to the Station the Club gave a donation of £250 to the charity. 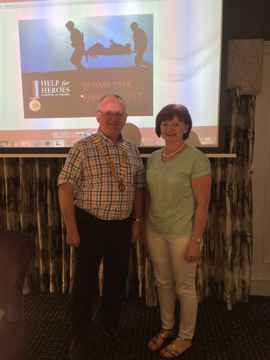 Pam took part in the Help for Heroes Burma Walk at the end of February 2017. One of the reasons Pam decided to take part was that her Dad had served in Burma during the Second World War. The trip started in Rangoon in Burma, a very busy city with lovely architecture. Following a tour the group took a flight to Heho and then travelled in a small Chinese Buffalo, (a one cylinder truck) to start their walk. We trekked for 3.5 hours and then spent our first night in a monastery. Day 2 we walked through mountain forests and made our way to a village where the locals came to meet us, after lunch the walk continued and we reached the next monastery. Day 3 the group continued their trek walking through fields where farmers were working with old fashioned ploughs and oxen. The next two days was more of the same, each night the group stayed in monasteries, where facilities were quite primative. The total distance walked was 75 miles, with the group trekking about five hours each day. Our main source of food was noodles and rice, temperatures were generally in the high 20's C. At the end of the trip we were delighted to chill out at a beautiful hotel which was built on stilts, before returning home. Ivan was born in Welshtown near Ballybofey, and lived on a family farm before moving to Trillick in 1956. Ivan worked on the family farm while still at school. 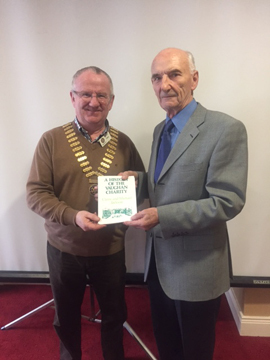 He joined the commercial course in the local technical college before taking up employment in 1960 with B. C. Stuart hardware store in Enniskillen, his first wage was £2.50 per week. In 1966 Ivan joined Creighton's furniture store. After working in Creightons for six years he decided to start his own business and in 1972 he purchased the ground floor of the Regal cinema. In 1975 the building was damaged in a car bomb attack, but following repairs, Ivan continued to trade in the premises. In 1990 he bought the Wellworth's store on the Dublin Road. Following on from this, Ivan then purchased units on the Derrychara Link road and continued to trade there under the banner of The 3 Kee stores. At this point Ivan employed 17 staff and the business had a turnover of £1million per annum. In 2010 Ivan had his "last closing down sale". SUSAN JOHNSTON - Easyjet Cabin Crew Susan informed the Rotarians that Easyjet was launched in 1995 by the son of a Greek shipping tycoon. Initially they were based in London operating domestic and international services to more than 30 countries. The company currently has a fleet of 220 Airbus aircraft, the average age of the aircraft is 5.6 years. The Belfast base has five aircraft. Safety Equipment and Procedures - Dealing with a planned/unplanned emergency; Pilot incapacitation; Ten point emergency drill; Dealing with a bomb or suspicious device. Aviation First Aid - Providing immediate care to the patient; Activate the medical action plan; Trained in use of De-Fib. Aviation Security - At present there is a severe threat level; How to deal with a hijacking. Customer Service - Dealing with different types of passenger - stags/hens, disabled; Tailoring the flight to the type of customer - businessmen, early morning; Sales. Report for duty at 5.00am; Briefing with the pilots - weather/flight times/drinks; Arrive at the aircraft 45 minutes before departure; boarding commences 35 minutes before departure; after doors closed and armed for departure - safety drill; provide food/beverage service; 15 minutes before landing prepare the cabin for arrival; disembarkation; 25 minute turnaround before boarding starts again. Easyjet are a good company to work for, they are a young airline and continuing to grow, cabin crew are involved in decision making, well looked after financially, crew have shares in the company. Roy began his story by outlining his early life, he was born in Lisnaskea in 1944, initially he wanted to do engineering, but this did not work out. He studied for three years in Leicester Polytech between 1963-1966. He started worked in the Enkalon factory in Coleraine, following the closure of the factory he moved to English Sewing Cotton in January 1967. He was married in 1970 and initially lived on the factory site. In 1975 he was appointed Production Manager for the plant, in 1977 the industry was in difficulty and he was transferred to Manchester. During the period 1980 - 1981 major changes occurred with more automation being introduced resulting in seven mills being closed. His next move was to South Africa where he managed a factory in Durban from 1982 -1984. Another move back to Manchester followed, he was appointed Central Services Manager in 1985. At this time there were three sites in the U.K., the dyeing process was transferred to Scotland which resulted in him being relocated to a plant in Neilstown. Major changes in the industry occurred in 1991 with Tootal and Coates merging. In 2000 several mills were closed across Europe and he was transferred to India to oversee a spinning/weaving project. The final transfer back to the UK was to Headquarters in London, at this point the job entailed a lot of travelling across the world, so Roy retired in November 2004. The business began in 1931 when his grandfather purchased a shed on the Dublin Road and opened an Austin Car and Commercial business. During the Second World War the premises were used to service army vehicles. Another retail business was purchased on Hall's Lane, but the Council purchased the business to make a new road, the two businesses were merged and became an Austin & Rover agency and a Landrover agency. In 1950 new premises were built, in the early years the business consisted of a parts department selling Lucas products and batteries, along with replacement engines. In 1962 they purchased the Triumph business from Isaac Agnew, along with Ferguson tractors. Peter joined the business in 1974 and new premises were built in 1977 which accommodated 21 cars. In 1993 the Ford franchise was purchased following the closure of Erne Engineering. Further renovations took place in 2006/7. Peter retired from the business in 2016. His subject was the history of the Vaughan Charity which was born out of the will of a generous benefactor from Donegal. 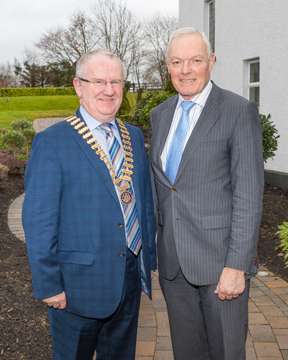 George Vaughan, who owned estates near Buncrana also owned land near Kesh had family connections in Fermanagh. A single man, he was always interested in the betterment of farming practices. In his will he stipulated that while his assets be left to his family they were obliged to provide an educational establishment to accommodate 300 boys and 200 girls from Co Fermanagh. Unfortunately circumstances changed following his death and the revenue from his assets fell far short of that needed to finance the type of establishment envisaged in his will. When a school was eventually built at Tubrid it was much smaller than originally envisaged catering for just 60 boys and girls of all religions. An Act of Parliament in 1936 ensured that the school lands were given over to the Ministry of Finance who established ‘The Vaughan Agricultural Institute’. A body of administrative Trustees was set up to manage the Institute. The objective of the Institute was to demonstrate farm management techniques to local farmers. By the early 1970’s, with the establishment of the new Enniskillen Agricultural College and the Grassland Experimental Centre at Castle Archdale, there appeared no further use for the Institute. The Vaughan’s Charity Order 1973 ensured the Tubrid lands and buildings were sold off and assets were invested by the Charities Branch of the Department of Finance. While the funding emphasis is on agricultural education and training, the Vaughan Trust also offers a range of livestock improvement schemes and has sponsored applications which offer potential benefits for farming in the County. The vision and generosity of George Vaughan has left a continuing legacy, perhaps even greater than he himself may have envisaged. Our speaker at the Monday evening meeting on 12th September was Neal Somerville from Bangor, Neal is the Development Officer for Sea Cadets in N. Ireland and he spoke on plans for setting up a Sea Cadet Unit in Enniskillen. At present there are eleven Units in N. Ireland and it is planned that the twelfth unit will be based in Enniskillen. There are 14,000 Sea Cadets spread over 400 Units in the U.K. along with 9000 volunteers. The Sea Cadets caters for young people from the aged 10 to 18 years. They have the opportunity to gain life skills, qualification's, and employability skills. Also on offer is: adventure; land and sea activities; make new friends; international exchange visits; have fun and undertake training which includes the Duke of Edinburgh Award Scheme. 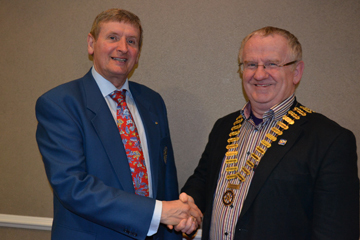 Rotarian Hugh Mills is Secretary of the Group and he outlined plans for setting up the new Unit, in the initial period the Unit will be based at the TA Headquarters and it is hoped to be operational by March 2017.